After living on that corner across from my home for many years, Mrs. Sims quietly moved to a nursing home. She’d broken her hip and did not go through therapy. As I went about my work that morning I felt a real sense of loss, of grief. We were scarcely more than acquaintances, Mrs. Sims and I, even after living in proximity for many years. I worked, so my free time was spent with my family. My son mowed her yard sometimes as he was growing up. I visited with her a few times when she was out in her front yard. I don’t think I would have recognized her if I saw her anyplace else but in her front yard, mowing her lawn with an old manual lawn mower, her stockings in a roll around her ankles, her white hair disheveled about an ancient face. We were linked by her poppies. Each year during Mrs. Sims’ tenure in my neighborhood, I waited with the eagerness a child brings to Christmas for the flowering of her poppies. A glorious bursting of flaming red covered her small front lawn for several weeks in late April and into May, the red and black flowers moving and shimmering in the constant Oklahoma wind, the little bell-like buds hanging down until the sun had ripened them and they, too, burst forth to add yet more crimson to the already gaudy yard. Then after too brief a stay, the sedate green of the yard would assert itself again, and Mrs. Sims would take her lawn mower and cut back the upstart flowers. The feast of color would be over for another year. As I looked out the window that morning at the little cardboard notice, two thoughts occurred to me. The first was that we may never know the effect that our actions will have on our family, our friends, and people we don’t even know. Mrs. Sims and I were only nodding acquaintances, and yet, each year for many years, her poppies were an important part of my life, something beautiful and extraordinary to look forward to. Little efforts at beauty and kindness leave trails and make ripples we may not recognize at the time. Mrs. Sims was probably unaware of the tremendous pleasure that her poppies gave me over the years. Which brings me to the second thought. I should have told her. I should have shared with her how much her poppies meant to me. 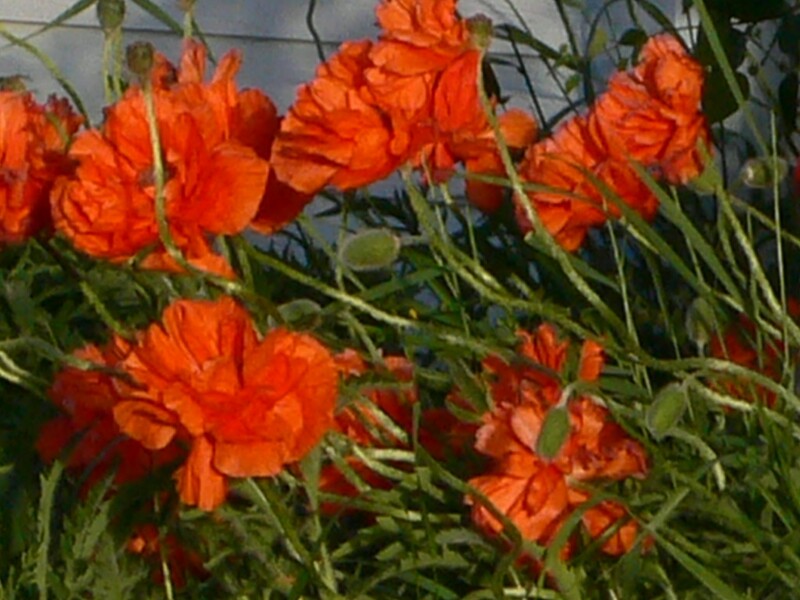 She knew to some extent, because one year I took pictures of the poppies. I comfort myself with that thought. Life, however, is very short. I won’t have a chance now to tell Mrs. Sims how much her poppies meant to me. The ripple I might have caused won’t happen because I didn’t share with her my pleasure in her beautiful flowers. We need to be sure we say thank you. Had she known how much those flowers meant to me, it might have given her courage and helped her over one of the rough times that inevitably come to all of us. ‹ WHAT AM I DOING HERE?